December 1, 2018 By Leroy Thompson & filed under All Articles, Long Guns, Tactics/Training. Thompson shoots from standing rest at 100 yards. 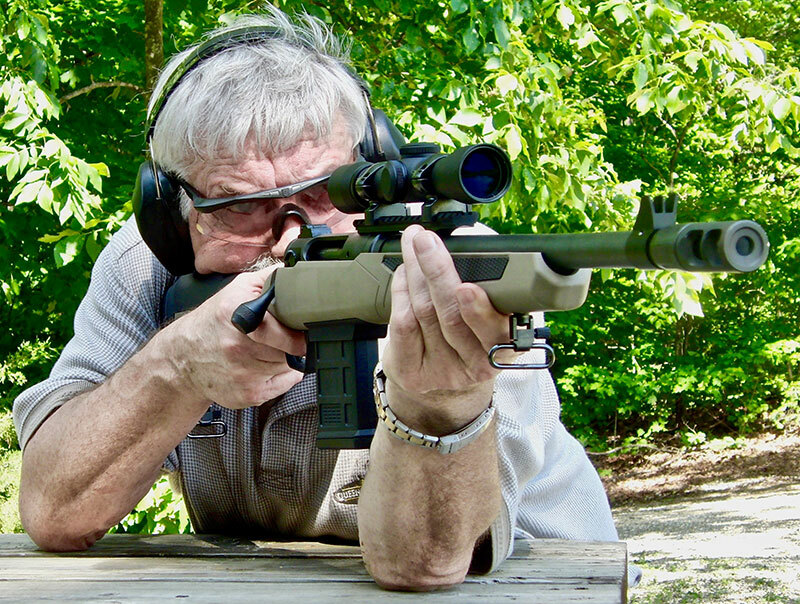 When Jeff Cooper developed the Scout Rifle concept, he envisioned it as a rifle to fulfill all of an individual’s needs, the only rifle he would need. For most reading this column, that would likely not be the case. You probably own multiple rifles. I see a Scout Rifle as performing three basic missions: hunting, self-defense, and preparedness, with the last of the three actually a combination of the first two. I have also written in the past that I see a place for the Scout Rifle as a law enforcement long arm. Admittedly, M4s look more tactical and allow an officer to put a lot of rounds downrange quickly, but are either of those necessarily positives? Many scenarios in which a police officer might need a rifle can be solved with a scoped Scout Rifle. It can be used to take out an active shooter at a distance, dispatch a wounded or rabid animal, or grant stopping power or penetration if needed against a vehicle or subject wearing a ballistic vest. Another advantage of the Scout Rifle for both private citizens and law enforcement officers is that it does not look like an evil “assault weapon.” It is a sporting weapon for the citizen and a precision tool for the police officer. 110 Scout comes with array of spacers and risers to adjust stock to fit. Everything shown except the Phillips screwdriver is included. At different times and for different reasons, I vary the long arms I carry in my truck. I have carried an M4 or a .308 AR-15-type rifle—usually my SIG 716. I have also carried a Scout Rifle. For some urban jaunts here in St. Louis, I’ve carried a shotgun (lately a Mossberg Shockwave). Once in a while, I carry a rifle and a shotgun. Lately, I’ve been trying some of the rifle-caliber pistols such as the Springfield Armory Saint with arm brace as truck guns. They are appealing because they are so compact. My SIG 716 offers a .308 rifle with a good scope, high magazine capacity, and self-loading action. It’s also the heaviest of my potential truck long guns, and the SIG 716 is an expensive rifle. I prefer not to have anything too costly in my truck. I could discuss my rationale for carrying different long arms in the vehicle, and maybe I will in another column. But this column is about a new Scout Rifle that I think would make an excellent truck gun. Ability to adjust length of pull and comb height using spacers and risers is a big selling point of Savage 110 Scout. The Savage 110 Scout offers appealing features at an attractive MSRP of $819. 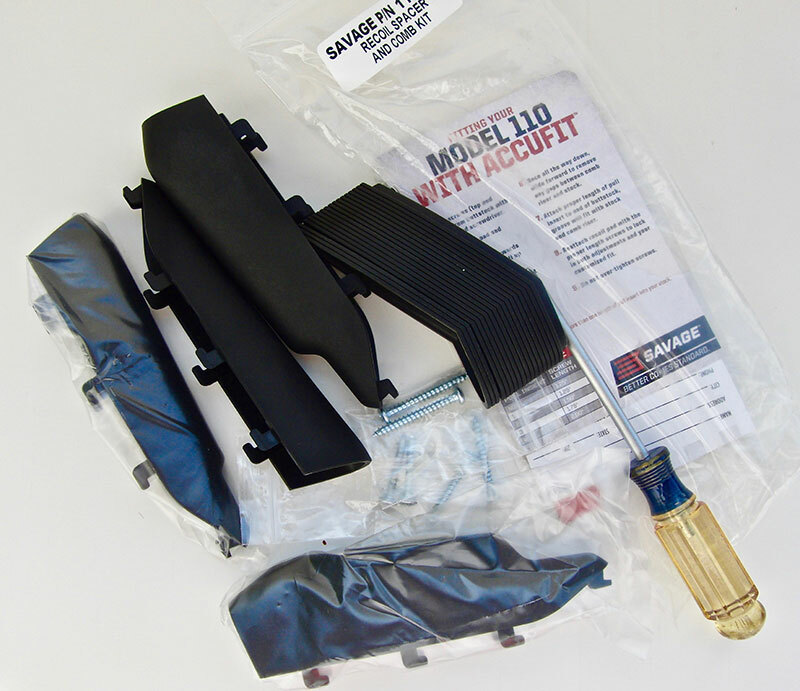 A big selling point for me was Savage’s AccuFit, which allows the rifle to be tailored to the individual by quickly switching out modular pieces to adjust length of pull and comb height. I’ve learned with Scout Rifles that the forward-mounted scope requires the comb height to be just right to get a proper cheek weld with this type of scope. The 110’s five interchangeable risers allow comb height to be tweaked to suit the user’s needs. I mounted the Weaver Scout scope and kept trying different risers until I found the one that worked best. There are also spacers to adjust length of pull, but the 110’s length of pull fit me out of the box. Because the Scout Rifle is intended to function as a preparedness rifle, I feel that good BUIS are a necessity, and those on the 110 Scout—rear adjustable peep and front blade with protective ears—are useable. Having said that, the rear sight sticks up enough that it should have some type of protection as well. 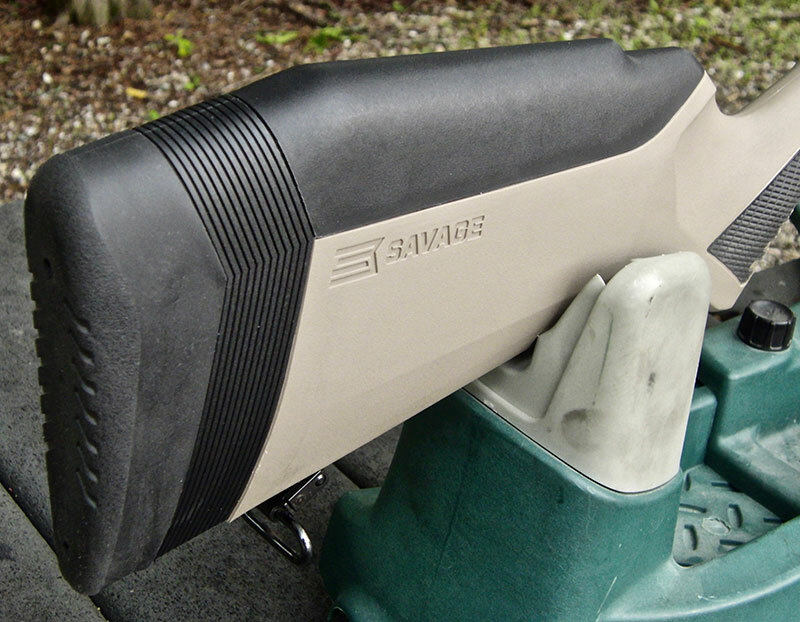 Right-side view of Savage 110 Scout with forward-mounted Weaver 4X28mm Scout Scope. A Scout Rifle needs a forward-mounted Scout scope, and I chose the old standby Weaver, but in 4X28mm magnification rather than the 2.5X used on some Scout scopes. The 4X magnification gives more range but still offers a wide field of view. I found the 110 Scout’s Picatinny rail just the right size for mounting a compact Scout scope. 110’s ten-round magazine and its good-sized paddle mag release. 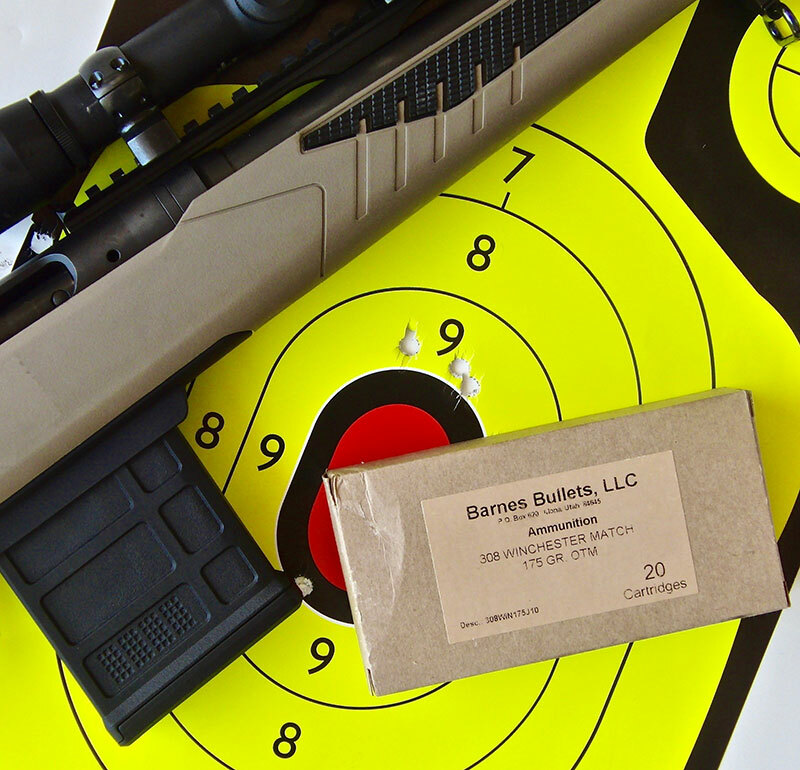 Ten rounds is the standard capacity for most Scout Rifles, including the 110 Scout. For hunting, a magazine with less capacity would be needed depending on state laws. For survival hunting after the Zombie Apocalypse, the larger capacity magazine should be fine. 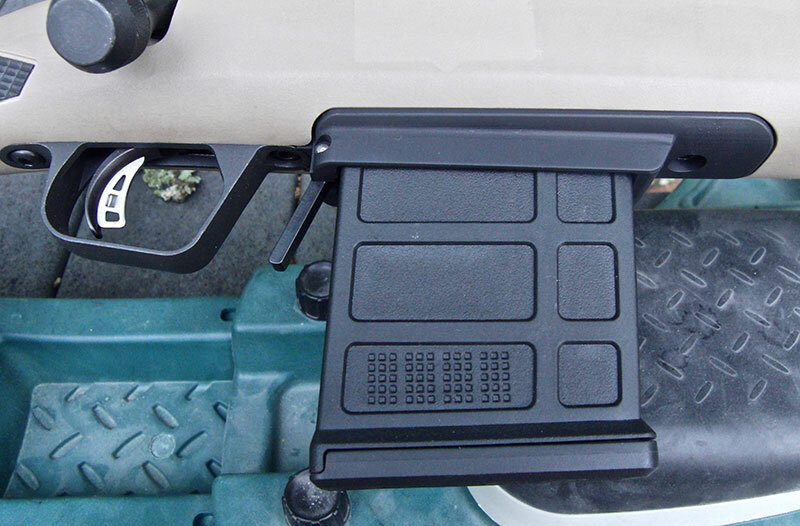 The 110 Scout’s magazine release is a good-sized paddle that may be operated easily with the support hand while grasping the magazine and pulling it free. Let me also mention the calibers the 110 Scout is available in: .223 Remington, .308 Winchester, .338 Federal, and .450 Bushmaster. I consider the .308 the most versatile caliber for a Scout Rifle, so that is always my choice in this type of rifle. Along with .223, it is also the most likely to be obtainable. For someone who normally uses the AR-15 rifle, an argument could be made for a .223 Scout to allow ammo interchangeability. Still, I would choose .308. 100-yard three-shot, one-inch group with Barnes 175-grain OTM. The 110 Scout’s muzzle brake seems to be effective. I certainly didn’t notice excessive noise or blast with the 140+ rounds I’ve fired through the rifle. 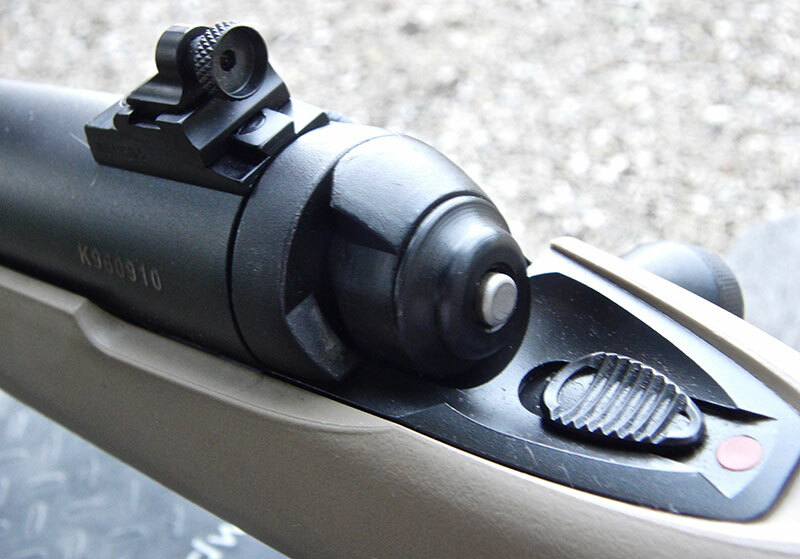 The 110 Scout’s safety is a slider atop the receiver that is easily operated with the thumb of the shooting hand while retaining the shooting position. One of the best features of the 110 Scout is its trigger pull. It is very good and helps markedly with accurate shooting. And the 110 Scout did shoot accurately. I did my testing with Barnes 175-grain OTM Match, SIG Sauer 175-grain OTM Match, Black Hills 175-grain HPBT Match, and Federal 168-grain Sierra MatchKing. My groups were not all fired in my first session, so a precise comparison isn’t valid. But all groups were in the one- to 2.75-inch range at 100 yards. The best group I shot was three shots into one inch with Barnes 175-grain OTM, but the SIG Sauer 175-grain OTM came close at 1.5 inches. Those groups were fired during my second shooting session, when I was more used to the rifle and the scope. In my first session, the best group with Black Hills 175-grain went into two inches and with Federal 168-grain went into 2.75 inches. Both of those loads usually perform very well for me, so I want to re-shoot groups with them the next time I take the 110 Scout to the range. Peep back-up rear sight and sliding safety. Specs for the 110 Scout are: overall length 37.5 to 38.5 inches depending on the spacers installed, barrel length 16.5 inches, and weight 7.72 pounds, which make for a relatively compact rifle. I rate the Savage 110 Scout highly. I especially like the AccuFit features that allow it to be tailored to my size and to the cheek weld for the Scout scope. I am also pleased with the trigger pull. Its price is in its favor as well, offering an affordable Scout Rifle for the shooter on a budget. This one may go into my truck as a versatile companion rifle.